In preparation for his coming exhibition at the National Museum, George Edozie will have on the 15 and 16 of March a private viewing of his recent works. It will take place at the Pan-African University, Victoria Island Campus. I copy the few words I have writen as an introduction to the exhibition. George Edozie has titled this exhibition of his recent works “Expression of a journey”, and this label is only partially apt. Those of us who have followed his growth as an artist know that expression is a recurrent word in his vocabulary and a defining concept in his self-understanding as an artist. But he is not, he can’t be, an expressionist in the way Herwarth Walden used this term for the first time in 1911. Much less is he in line with the neo-expressionist painters in Germany, Italy and USA in the late 1970’s: Baselitz, Clemente, Kiefer, Schnabel. In a loose way, he is, and we are all “expressionists”. We express ourselves through all our actions: when we choose a pair of shoes or when we decide what of telephone handset to buy… In an artwork, the themes, colours, techniques and materials, what is present and what is absent, the shouts and the silences, always tell us something about the artist, and about the time and cultural milieu in which he or she lives. Whoever has stayed for a few minutes in front of the Guernica knows how powerfully Picasso expresses his anger and his pain. Anybody in front of the Pietá, is touched by Michelangelo’s expression of tenderness and grief. No, George Edozie is not an expressionist, but he shares a good number of the formal characteristics of the “fauvist” and “post-impressionist” painters at the turn of the 20th century: Cezanne, Matisse, Gauguin, Van Gogh. In different ways, these artists went beyond the manner in which impressionism focused on reproducing the impression caused by the physical world. For the “fauves”, what mattered were the subjective, personal emotions provoked in the artist and their expression through strong, colourful, vibrant use of formal elements. They were not trying to reproduce the impression brought about by the immediate physical reality, but to express the artist’s inner world and his or her reaction to the external one. 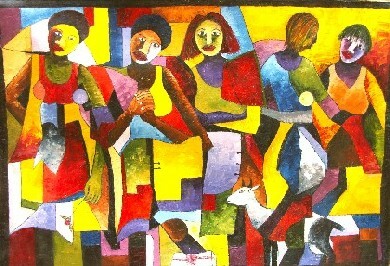 In common with them, Edozie’s works show some recurrent features: (1) use of bright, primary colours, (2) use of the impasto technique, and (3) use of simplified forms. “I exaggerate the fair colour of the hair, I take orange, chrome, lemon colour and behind the head I do not paint the trivial wall of the room but the Infinite. I make a simple background out of the most intense and richest blue the palette will yield. The blond luminous head stands out against this strong blue background mysteriously like a star in the azure. Alas, my dear friend, the public will see nothing but caricature in this exaggeration, but does that matter to us?” These clear words of Van Gogh, said a century ago, have been learnt well by George Edozie. One only has to look at any of his numerous “tilting heads”. In this, he follows the famous Van Gogh dictum: “Instead of trying to render what I see before me, I use colour in a completely arbitrary way to express myself powerfully”. In his works, there is neither an imitation of reality nor a quest for the “creation” of perfect beauty. For him, expression rules over mastery and he tries to achieve it mainly through the use of colour and texture. In the works shown in this exhibition, he generally disregards the tonal graduation of traditional painting and gives autonomy to colour (mostly, unmixed) and brushstrokes. That is why some of these works might seem strident and brash at first sight. Lately, he has started introducing “collages” and pastel colours and this is softening considerably the strength of his paintings. Edozie is not an “expressionist” because -though there are some formal similarities- the mood, the ethos, are different. The members of the pioneer expressionist group Die Brücke (The Bridge) —Kirchner, Heckel, Schmidt-Rottluff and Bleyl—were obsessed with dark images of anxiety, angst and alienation. 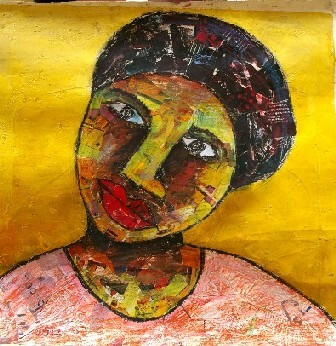 George Edozie is not, though few of his works are cheerful and there is no much joie-de-vivre in them. In the best ones, there is restraint, permanence and calm. Perhaps because he studied at Benin, and not at Nsukka, Zaria, Auchi or Ife, George Edozie is a loner among Nigerian contemporary artists. Unlike in the case of most of Nsukka or Ife artists, tradition does not play a central role in his works. He is not enriched (or burdened?) by the past, but he is also able to go deeper than the shallow formalism of many the Auchi artists. Because he does not believe in art for art’s sake, there is a “narrative” behind each painting, an engagement with people and society, an active look at persons, situations and the dynamics of social groups. This is, in my opinion, his greatest strength and what provides significance and potency to these singular works. Posted on February 21, 2008 December 3, 2009 by Jess CastellotePosted in Artists, ExhibitionsTagged George Edozie. Real cool write-up. It is difficult to place George in any strict art style which is why I believe he suffers in the Art market, but this show will change that. Thanks for this great write-up, Jess. In my opinion, I think Art generally is a thing of the mind. George has his own style of painting which comes straight from the mind. I dont believe in compromising standards so George should stick to his beliefs and be known for what his painting stands for. People will eventually understand the beauty in his works. Kudos George and continue to allow your heart speak out in your works. i see Edozie works coming out more strongly. his composition are well organized with an engaging insight. i see his works as a bridge between western and african civilization. Jess, you are a wonderful orator welldone,Edozie one thing i can say C’est cera cera, meaning- What will be will be, the sky is not the limit but a steping stone. George is an excellent artist in the making, besides a super human being. The tilting heads, the love collages, his somehow provocative approach to religion , shows you how painting can be both extrovert and intimate at the same time. The yellows and the blues he uses remind me some of the colourful compositions of Van Gogh and the blacks to some of the background of Goya’s masterpieces. Keep it up and be sure that you will soon be rewarded. George remains George! Lets give it to him.